Dimension Data, the big systems integrator, bought OpSource for its cloud services in June, and is now unveiling the updated clouds offering under its brand. The services include a public compute-as-a-service cloud, a private version of same, as well as managed hosting and managed services — all using the same technology base. What the company promises here is wide deployment choice for companies that want to build internal private clouds for security or other reasons or want to put all or part of their workloads into a public cloud. 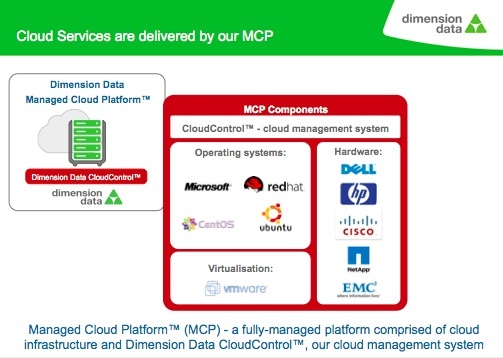 Dimension Data Cloud Services layer OpSource’s software know-how atop EMC(s emc) storage, VMware(s vmw) virtualization, Cisco(s csco) networking and Dell(s dell) servers, Caindec said. The platform is managed by Dimension Data’s Cloud Control which provides the workflow orchestration, resource provisioning, and billing. A service administration layer does all the metering, sets the permissions and enforcement. These cloud services hit a market that is rapidly filling up with cloud computing options. Just last week, EMC — which already backs the VCE company that bundles EMC storage, VMware and Cisco UCS servers — said it would team up with a VMware and Atos, a French IT giant with global presence, on Canopy, another wide-ranging cloud services initiative. And, another tech triumvirate — Cisco, VMware and NetApp(s ntapp) — offer a FlexPod hardware-software bundle that competes with the VCE’s Vblock offerings. The biggest webscale clouds — the prototypes of which are run by Amazon(s amzn), Microsoft(s msft), Google(s goog), Facebook or Zynga(s znga) — tend to deploy commodity “scale-out” hardware. That trend leaves premium vendors — EMC, Cisco, NetApp — looking for ways to embed their pricier hardware in cloud deployments. Hence all the joint efforts. Last week it was Canopy, this week DiData, stay tuned for more.